A business process is the flow of information (or documents) by a previously defined route or scheme. A business process scheme can specify one input and one or more output points. The sequential modules are used for processing a predefined limited life cycle. The typical example is creation and approval of a text document. Any sequential process usually includes several actions between the start and end points. The General tab, among the fields common for most of the objects (Name and Description), includes the options controlling the way the process is started. Being a standalone service routine is rare for a business process. Usually, a business process requires start-up parameters like documents on which they will run. To make your business process aware of the input entities to operate upon, click the Parameters tab. The variables are temporary storage for data, generally used for business process. The variable values exist while the process is running. To avoid mess and misuse, remember to give users the proper permission to access the business process. For a sequential business process template, the visual modeler opens as soon as you have specified and saved the parameters. 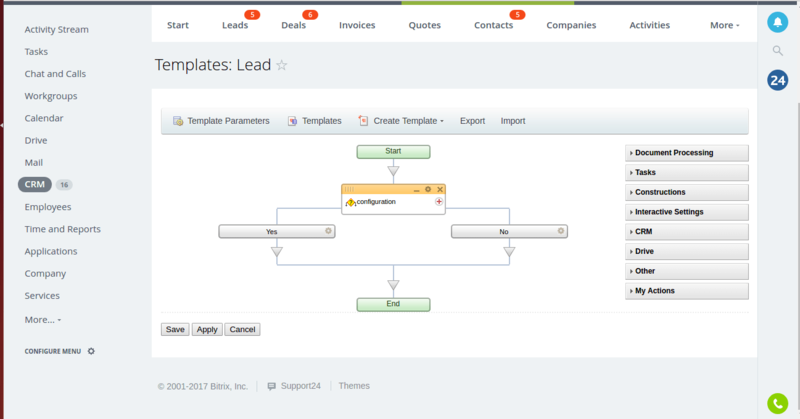 To construct a template, just drag-drop the required actions to the design area and configure their parameters. To configure the action parameters, click the button. Consider the above example of the process Event action.